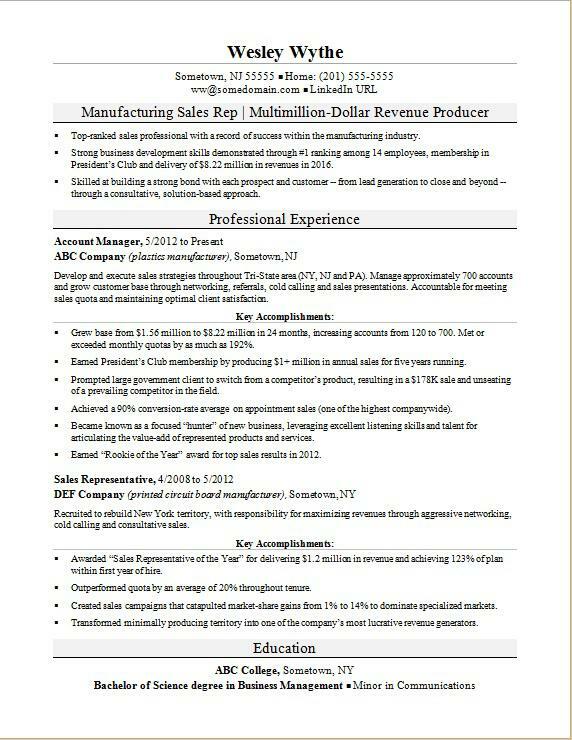 View this sample resume for a manufacturing sales rep, or download the manufacturing sales rep resume template in Word. Need to sell your sales skills and experience to potential employers in the manufacturing industry? View the sample resume below, and download the manufacturing sales rep resume template in Word. And if you need more help, get a free resume evaluation today from the experts at Monster's Resume Writing Service. Jobs for manufacturing sales reps are projected to grow by 5% (or 94,100 jobs) from 2016 through 2026, according to the Bureau of Labor Statistics (BLS). You'll find the highest level of employment for this job in the following states: California, Texas, Florida, New York, and Illinois; and in the following metropolitan areas: New York City, Chicago, Los Angeles, Atlanta, and Houston. As a manufacturing sales rep, you can expect to earn a median wage of $60,340 per year, or $29.01 per hour, according to the BLS. Additionally, you can learn more about manufacturing careers and sales careers on Monster. Top-ranked sales professional with a record of success within the manufacturing industry. Strong business development skills demonstrated through #1 ranking among 14 employees, membership in President’s Club and delivery of $8.22 million in revenues in 2016. Skilled at building a strong bond with each prospect and customer -- from lead generation to close and beyond -- through a consultative, solution-based approach. Develop and execute sales strategies throughout Tri-State area (NY, NJ and PA). Manage approximately 700 accounts and grow customer base through networking, referrals, cold calling and sales presentations. Accountable for meeting sales quota and maintaining optimal client satisfaction. Grew base from $1.56 million to $8.22 million in 24 months, increasing accounts from 120 to 700. Met or exceeded monthly quotas by as much as 192%. Earned President’s Club membership by producing $1+ million in annual sales for five years running. Prompted large government client to switch from a competitor’s product, resulting in a $178K sale and unseating of a prevailing competitor in the field. Achieved a 90% conversion-rate average on appointment sales (one of the highest companywide). Became known as a focused “hunter” of new business, leveraging excellent listening skills and talent for articulating the value-add of represented products and services. Earned “Rookie of the Year” award for top sales results in 2012. Recruited to rebuild New York territory, with responsibility for maximizing revenues through aggressive networking, cold calling and consultative sales. Awarded “Sales Representative of the Year” for delivering $1.2 million in revenue and achieving 123% of plan within first year of hire. Outperformed quota by an average of 20% throughout tenure. Created sales campaigns that catapulted market-share gains from 1% to 14% to dominate specialized markets. Transformed minimally producing territory into one of the company’s most lucrative revenue generators.